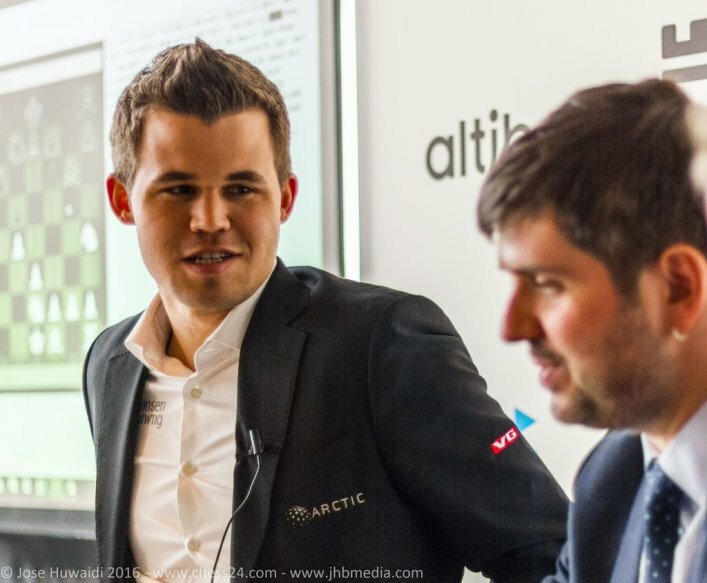 Magnus Carlsen is on course to win his first Altibox Norway Chess tournament after a move 12 novelty gave him an effortless win over his great rival Vladimir Kramnik. The biggest obstacle in his path is now Levon Aronian, who survived a shaky middlegame to beat Pavel Eljanov and remain a point behind Magnus before playing him with White in Round 8. The other games were all fighting draws, with Nils Grandelius in particular coming agonisingly close to a first win. 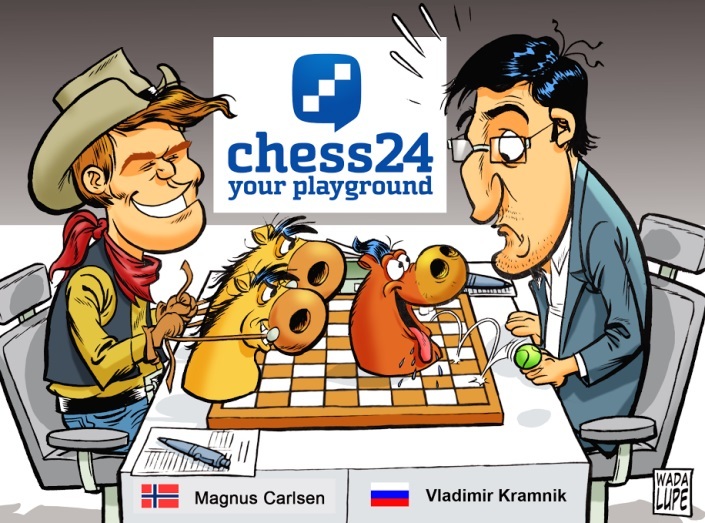 Before the tournament began Magnus was asked who he wanted to beat and replied, “Kramnik, I always want to beat Kramnik”, while Vladimir himself said that if he was going to lose in Stavanger it would most likely be to Carlsen. That all came to pass in the Stavanger Concert Hall on Wednesday, in a strangely one-sided encounter. Kramnik played a pet line that co-commentator Jan Gustafsson described as “the Berlin for 1.d4”, in which Black accepts a ruined pawn structure in exchange for the two bishops. The old main line the players followed had been thought to be holding for Black, but 12.Ne2! proved to be a very important new wrinkle. The knight is heading to f5, and suddenly Black’s standard plan of bringing his own d7-knight to d6, to cover the f5-square, is too slow. Kramnik immediately went wrong with a queenside assault that was easily refuted, and when he failed to acknowledge that defeat and accept a simply bad ending he was soon lost. In essence the game was a miniature, though it dragged on to move 50. After like 16 moves my position plays itself and it’s pretty hard to screw it up. Not even a day, but half an hour, I would say! 14…Na4 was a mistake, I just missed 15.Ngf5… I just feel like I haven’t played today… The position after 16.Rb1 was so bad that I just didn’t know what to do. I think Vlad, probably. With him you don’t ever stop having something to talk about, because he will talk! I wouldn’t take Peter anyway, because he doesn’t understand anything. He’s the sort of person you have to explain a joke to! You don’t want to be explaining jokes on a desert island. Some of the decisions were too trusting. We understand it’s Levon, but you want to grab central pawns at times! After 35…e5 36.g4! Aronian was able to transfer a knight to f5 to deliver the final blow. The way the game ended recalled Eljanov’s own victory the day before over Grandelius, with the computer counting down to mate in the final position. The other games were all fierce battles, where it was extremely tough to identify any clear goal-mouth opportunities. It’s not so easy to interrupt you, Peter! 37…Rxh2!! 38.Rxd7 (38.Kxh2 Qxc7 is good for Black) 38…Rh1+ 39.Kf2 Rh2+ 40.Bg2 Rxg2+! (40…Ra2+ loses to 41.Re2!) 41.Kf1 Rh2! and Black gave perpetual check. 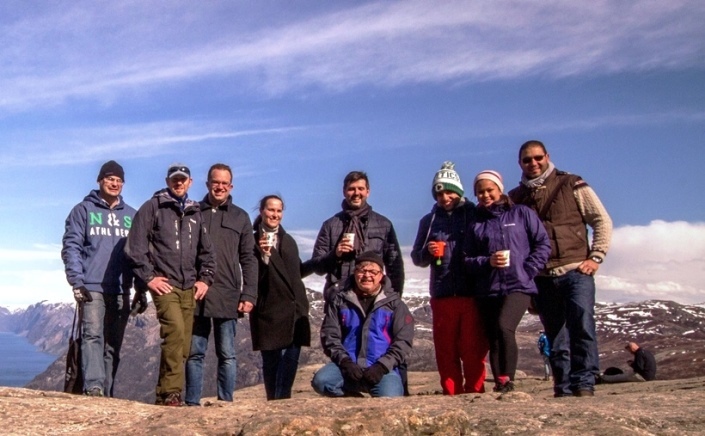 Though it should perhaps be mentioned that was already trolling either Hikaru Nakamura, or Norwegian cuisine, or both! Food was also on the mind of Veselin, who decided his reasoning for picking Anish to spend time with on a desert island – “he’ll listen to me” – was a little flawed. We don’t have a vegetarian guy in the tournament? Levon? Then I should pick him as I won’t be in danger! Maxime’s response was much better, though, with the Frenchman taking 16 minutes to decide on 8…Be5! – a move he later said was recommended in his files in many places for similar positions. After 9.Be3 he followed up with the hyper-aggressive 9…f5! and for a while seized the initiative, though later things swung back in White’s favour. Afterwards Harikrishna felt he’d missed a clear chance, though nothing was clear in the analysis, until he was ultimately the one who had to force a repetition at the end. Maxime feels he’s playing pretty well, though he wasn’t too proud of leaving himself with only 20 seconds to make his 40th move. With no chess in St. Louis (tonight of course sees the incredible Ultimate Blitz Challenge with Garry Kasparov!) it seemed like being an early night for European chess fans, but Nils Grandelius and Li Chao had other ideas. It’s about the ugliest position you can have without being material down! Dark-square hell for Black for the rest of the game. But after 69…exd5 70.cxd5 cxd5 71.Bxd5?! (71.Rxd5 avoids the trick) he ran into 71…b6+! and the worst was over for Black. In fact Li Chao even went on to be a pawn up nine moves later, and it was the kind of game that might have driven a lesser man to drink. I’m playing a bit better than I did previously, so I don’t see why I would be upset! The one way he could be made to look very touchable again, though, is if Levon Aronian can win his game with the white pieces against the World Champion in Round 8. Meanwhile MVL, Giri and Kramnik all have White, so we can expect to see them pressing hard for wins.